Candy crush saga is very in demand games in facebook. 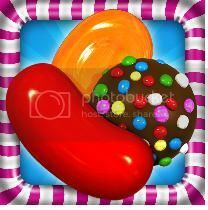 Many facebook users play the candy crush, the games is use your strategic skills to match as many sugary treats together in as few moves as you possibly can. As the description, the games are to create special sweets such as striped candy, wrapped candy and rainbow candy. Combine these specials to create spectacular effects such as Super Stripe and Mega-Candy.As become one of the players of these games I just enjoyed the games. And I feel that it makes me feel relax during I’m playing. Based on wikipedia, Candy crush games was released on April 12, 2012 for Facebook, and then released on November 14, 2012 for smartphones.